Rex Griswold was diagnosed with Multiple System Atrophy (MSA) in 2011 at the age of 51 and immediately dedicated his life to generating awareness and raising funds for research to find a cure for this horrible disease. Over the next six years, Rex worked to draw attention and generate funds for research – all the while knowing he would not survive to benefit personally. 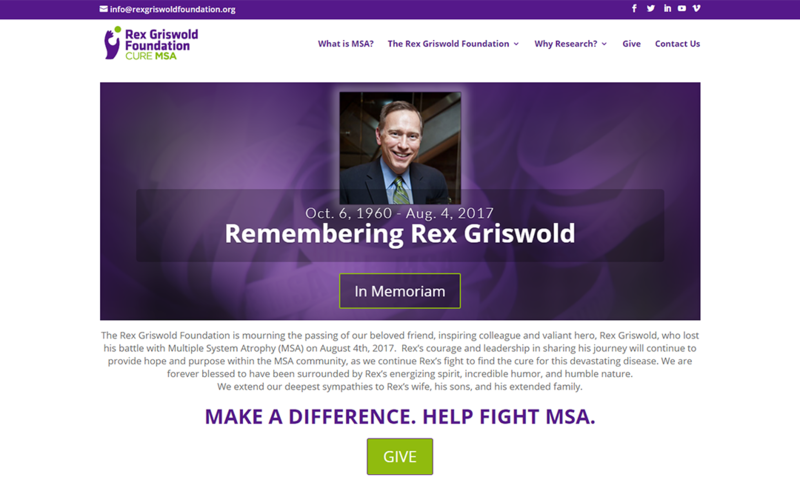 We worked closely with the Rex Griswold Foundation and Rex’s colleagues at Nestle Waters USA to revamp the foundation’s web presence and provide a content management system that will allow the foundation to continue to attract other stories of courage, as well as generate funds for research toward finding a cure.